Like many of you we woke up on Sunday to the horrific news that the current federal administration has active plans to systemically erase trans and gender diverse folks from public life. 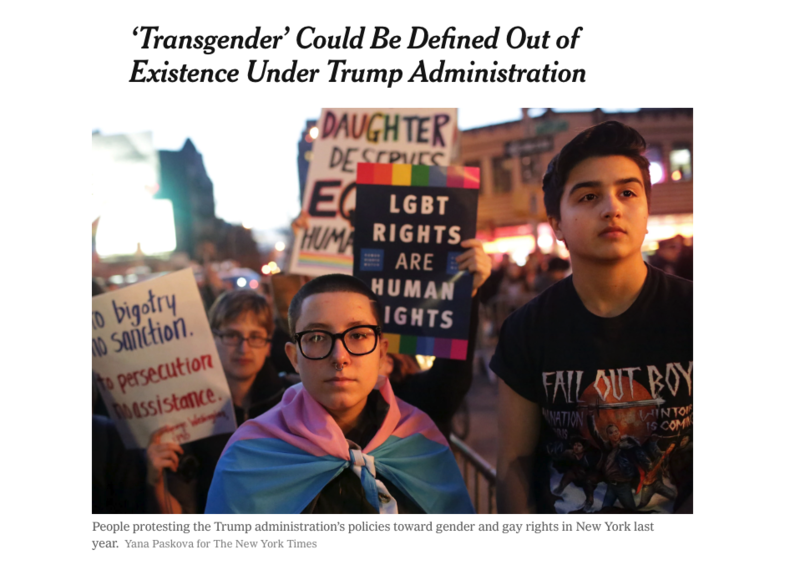 Screen shot of the New York Times front cover detailing a memo leaked about the federal administration’s plans to erase trans people from public life. Two young people at a protest, one on the left is wearing a trans flag. We have taken a few days to respond to the increased need for support from community members but we wanted to take a moment today to offer our perspective, clarification and support to our communities. So many other brilliant trans leaders have shared their thoughts on the contents of the memo. If you’re looking for more information or larger reactions we would point you to you take a look at what Miss Major, Chase Strangio, Indya Moore, the National Center for Transgender Equality, and the Transgender Law Center have shared. To be clear, this is another attempt that is a part of a methodical and intentionally violent attempt to erase trans and gender diverse folks from public life. We know that we #WontBeErased and that while this is a scary time for many in our communities it’s also important to us to call out that systemic barriers and violence have long prevented so many in our communities from being seen, celebrated and supported. For trans folks of color, low income trans folks, undocumented trans folks, trans folks in rural areas, incarcerated trans folks and our intersex siblings it has long been hard to access the resources and services needed for us not just so survive but thrive. We are working hard to change that reality and hope you will join us by taking some of the actions down below. It is also important to clarify that while this is a serious attack on our community this memo is not a law or a policy that will affect any immediate changes. This memo puts the President in direct opposition with several rulings in federal courts across the country. There are advocates and elected officials across the country that will take every action possible to combat this should any attempt be made to put this into affect. This week Governor Inslee, the Office of the Insurance Commissioner and the Attorney General have all issued statements affirming their support for our communities. Please do not forget that the Washington State the Washington Law Against Discrimination protects against discrimination on the basis of gender identity. Please continue to access services, exercise your rights and live your authentic lives as you have been before this awful news. We owe it to our elders and all of the labor they put in to creating the world we have now to continue fighting and living life as authentically as possible. If you have been discriminated on the basis of your gender identity please reach out to us for support. If you are worried about being able to update your identity documents or access other services please reach out us. We’re here for you and our community financial assistance program means that financial barriers are not a factor as you are trying to amend your identity documents, access gender affirming clothing or hormone replacement therapy. – If you are trans, non-binary, gender non-conforming or gender diverse person looking for community please join us at our support group tonight and every Wednesday. – Support expanded access to gender affirming healthcare; on November 6th we will be joining other trans leaders and allies to testify before the Healthcare Authority to advocate for better access to care for low-income trans and gender diverse communities. Join our email address and follow our social media pages for more ways to join us in these efforts. – Join us for a Trans Awareness Week event or tune in to some of our community conversations; we’ll be sharing more information shortly both on our calendar and our social media pages about the community events and conversations that we’ll be hosting through out the week. This is a great opportunity to learn more about the amazing work happening in trans communities in the Puget Sound region. – Share our Trans Justice Voter Guide and ensure you’re asking tough questions about where the candidates in your community stand on trans justice issues. – Support mutual aid and giving circles that move financial resources directly to trans folks; if you’re not able to give financially you can help spread the word about our community financial assistance program. – Support trans and gender diverse siblings in Massachusetts as they fight an anti-trans ballot measure.